This entry was posted in Peru, photography and tagged art, artist, arts, culture, Guillermo Guzman Manzaneda, Huancayo, huancayo peru, indecent songs, painter, Peru, quechua, Salvador Dali, The Andes. Bookmark the permalink. From Cayo Hueso to Rio Miel! Nice to hear Alexandra. As far as I remember I had some wishes about the picture and how I would like him to pose. It was more of a coincidense meeting this man..Someone told me(seeing a gringo with a camera) to enter this building and visit a very special man “un pintor” so I did. Later on I learned that Guillermo Guzman Manzaneda is a recognized artist with paintings at display all over the world. Among others, Walt Disney has bought some of his art! Guillermo Guzman Manzaneda died 1986. How lucky I am you took this phot now I am sure I have an original oleo painted by manzanedo. the one in the photo. do you know anything else about it. thank you for your answer. Íncredibel coincidense Nelly.. so nice to hear. 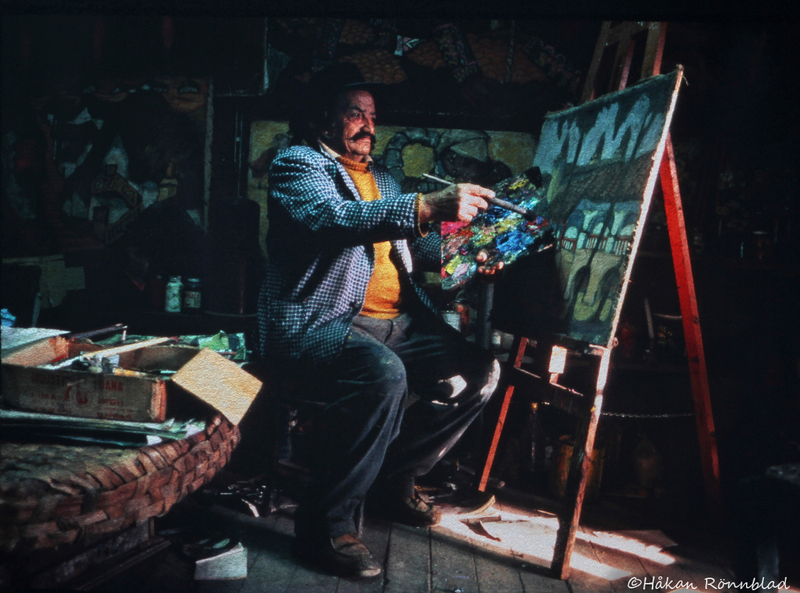 I ran into him in Huancayo 1979 and he invited me to his studio. He painted and sang songs in Quechua for me. Indeed a fine memory.. Thank`s for your comment and welcome back. Thank you for your answer, i am nelly´s dad , do you think he painted three different versions of la casona?, because the one in the photo you took is different from the one in my living room and the third one is in his niece´s collection, which looks a little different too. I am really disappointed, is mine fake?. How can I know about it , please help me. thank you very much. could well be an original as the one in the photo. I am not an expert on this artist I just happened to meet him by coincidence and took a picture. Anyway its very nice to bring life to that pic thanks to your story.. Jose, Are you Peruvians originally or? Thanks for your interest and greetings from Håkan Rönnblad. Thank you for this exposure. I met Guillermo in 1978, enjoyed meals with him in Huancayo, and he hosted myself and college roommate at the National Museum, My roommate later brought him to the US for an exhibition in Philadelphia. I still have a several pieces of his work — including a stylized image of young men on horseback painted onto a 7′ long closet door. He was quite the entertainer and storyteller with a general disdain of tourists and of politicians! That´s very interesting to hear Craig. An entertainer for sure.. that song he sang to me..
information about a man I photographed about thirty years ago. Thank´s for visiting Craig and welcome back. I’ll take a photo of the pieces I’ve currently hanging and forward them to you. Please do. I would love to see. And maybe I can make a better repro of that slidepic with Guzman. The one on the blog I just photographed in a primitive way and the result is not very elegant. Hi, I’m William Thomas Huancayo, Communication student at the Universidad NAcional del Centro del Perú, we are editing a magazine portraits. You’ll be grateful for Guillermo Guzman Manzaneda files are scarce, and even more artistic.